The final book in the trilogy begins two years after Erlend's punishment for his part in the treasonous plot that almost cost him his life. Kristin & her family are back at her childhood home, Jørundgaard, as Erlend's properties are forfeit to the Crown. Erlend feels like an outsider among the people on Kristin's estate. His manager, Ulf, has also come to oversee the work on the farm & he's resented as well. Kristin, too, is still remembered by some as the girl who broke her father's heart with her scandalous marriage to Erlend. Kristin's sons are growing up & she tries to keep the youngest, Lavrans & Munan, at her side as long as she can as she watches the older boys chasing girls & getting into scrapes. But always with that secret, breathless anguish: If things go badly for them, I won't be able to bear it. And deep in her heart she wailed at the memory of her father and mother. They had borne anguish and sorrow over their children, day after day, until their deaths; they had been able to carry this burden, and it was not because they loved their children any less but because they loved with a better kind of love. Was this how she would see her struggle end? Had she conceived in her womb a flock of restless fledgling hawks that simply lay in her nest, waiting impatiently for the hour when their wings were strong enough to carry them beyond the most distant blue peaks? And their father would clap his hands and laugh: Fly, fly my young birds. Kristin & Erlend's marriage has always been difficult. Even the heady days of their courtship were marred for Kristin by her awareness of the sin she was committing & her grief at betraying her father. She was devastated by Erlend's imprisonment & did everything she could to help him but now that he's free, she feels the same conflicts she always has. Kristin strives to care for the house & farm while Erlend has no interest in the estate. She became so absorbed in the children that Erlend felt excluded. The misunderstandings between them escalate until Erlend leaves Jørundgaard, ostensibly to look into the state of a hunting lodge some distance away. However, he doesn't return & finally Kristin makes the journey to see him. Their reunion is passionate although she refuses to stay with him in this remote spot. She feels a responsibility to the farm & the children & returns home. Erlend refuses to follow her, even when he learns that Kristin is pregnant. Kristin's pregnancy & her secretive behaviour regarding the child become the subject of gossip, which only intensifies when she names the child after his father - naming a child after a living person was superstitiously avoided at the time. When Erlend finally comes home after one of the boys tells him about Kristin's plight, he's killed in a minor scuffle. Even his dying leaves Kristin conflicted as he dies without a priest to say the last rites. Kristin's son, Gaute, seduces a young woman, Jofrid, from a rich family. He kidnaps her & brings her back to Jørundgaard where they eventually marry after her relatives are pacified with a handsome settlement. Gaute has been left in charge of the farm as his brothers have chosen other paths. Kristin's relationship with her daughter-in-law is prickly as Jofrid is jealous of Kristin who tries to refrain from criticising Gaute & Jofrid's management of the farm & what she sees as their stinginess with visitors & travellers. Even her relationship with her grandson causes jealousy as Jofrid feels that Kristin is judging her & finding her wanting. Feeling shut out from her home & aware that her presence is causing tension, Kristin decides to enter a convent after undertaking a pilgrimage to atone for her sins. I loved this book. The story is completely involving but it's the characters that draw the reader in. Kristin & Erlend's relationship is no fairytale & every mistake they make is revealed unflinchingly. Their sons, servants, tenants & other relatives all live in the imagination & the setting of 14th century Norway felt real with the beautiful descriptions of the landscape & the attitudes of the people. My favourite character, though, is Simon Andressøn, the man Kristin rejected when she fell in love with Erlend. Simon has always been there, in the background of the story, kind, honourable, more than a little dull. He never stops loving Kristin, even after he marries her sister, & helps her to save Erlend from imprisonment. Kristin sees him as a brotherly figure & is oblivious to his true feelings for her. Kristin's skill as a healer saves Simon's son but, as well as her herbs & potions, she also carries out a pagan ritual when it seems that the child will die. This mixture of the pagan & the Christian permeates the book & leads to the sense of spiritual conflict that Kristin & Simon share. What had happened when the boy lay ill - that was something he must not and dared not mention. But this was the first time in his life that he reluctantly kept silent about a sin before his parish priest. He had thought much about it and suffered terribly over it in his heart. Surely this must be a great sin, whether he himself had used sorcery to heal or had directly lured another person into doing so. But he wasn't able to feel remorse when he thought about the fact that otherwise his son would now be lying in the ground. He felt fearful and dejected and kept watch to see if the child had changed afterward. He didn't think he could discern anything. I see Simon with a permanent worried frown on his face. His relationship with his wife, Ramborg, is blighted by her feelings of inferiority to Kristin & by Simon unconsciously comparing Ramborg's lax household management with Kristin's. He compares himself with Erlend & always finds himself wanting. He's not as handsome or as confident but he's more thoughtful & reliable. Unfortunately they're not the qualities to appeal to a headstrong girl. Even his one infidelity in his first marriage was a fling with a servant girl that resulted in a daughter, Arnbjorg. The girl lives with Simon & he loves her but Ramborg is jealous of her as well & her goodness & quiet efficiency just show up how lazy her stepmother is. Even Simon's death is the result of a minor accident that leads to blood poisoning. Kristin tries to heal him but, even on his deathbed as he tries to tell her of his feelings, she bustles around completely oblivious, not listening to him & he just fades away. It's such a poignant moment & I felt sadder about Simon's fate than anyone else in the book. I've just finished reading several very long books & all of them are going to be in my Top 10 of the year (at this stage, anyway) - John Forster's Life of Dickens, A N Wilson's biography of Queen Victoria (posts on both of these to come soon) & Kristin Lavransdatter. I seem to be in the mood for very long books at the moment, &, having finished these three over the last week, I'm not really sure what to read next. I've just started Mary Rubio's biography of L M Montgomery which I'm sure will leave me wanting to read more of her fiction. These are the books I've pulled off the shelves. 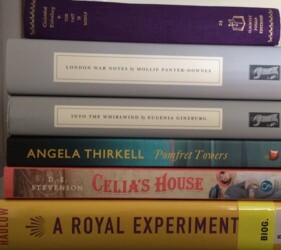 Virago will be reprinting more Angela Thirkell next year so I really should read some of the Thirkells on my tbr shelves before I order any more. The D E Stevenson online group is reading Celia's House at the moment but I didn't have time to start reading it when they did. Maybe I can catch up? I'm still in the mood for non-fiction & especially books about WWII so the Persephones & the Slightly Foxed edition of Christabel Bielenberg's The Past is Myself are calling me (& isn't it the most gorgeous purple?). Just in case I haven't read enough royal biography, A Royal Experiment is about George III, Queen Charlotte & their family. I'm also thinking about starting Sir Walter Scott's Journal & then reading another big Victorian baggy monster of a biography, the Life of Scott, written by his son-in-law, J G Lockhart. 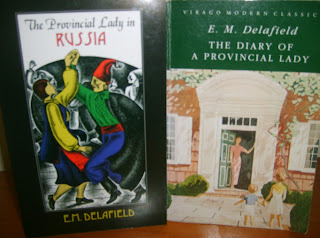 The first edition was in 7 volumes - (the second edition was in 10 volumes!!!) but fortunately I have an abridged version as part of the Delphi Classics Scott. 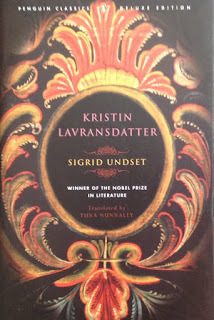 Kristin Lavransdatter is one of my favorite books. I have read it several times. I can't get enough of it. I agree that the last book is especially poignant. Kristin goes through so much. Young love is so different from marriage. Yes, Simon is so much more likable than Erlend. Erelend is too wild, and Simon saves his life essentially in The Mistress of Husbay. I was surprised at how much I liked Simon &, especially in this last book, we really get an insight into his feelings. I think I'll be rereading Kristin at some stage, I feel there's so much I missed that I need to go back to it.